It is very easy to find Zion Hill Baptist Church. All you have to do is take exit 81 off I-40, just west of Marion, North Carolina. Go out Sugar Hill Road for about one mile, then look for Zion Hill Road on the right. 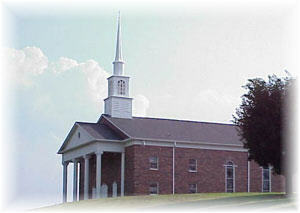 Travel on Zion Hill Road for one mile, then you will see the church on the right on top of the hill. We are only two miles off Interstate 40. We would love to have you visit with us here at Zion Hill if you are ever through this area! If you have any further questions about our location, simply click on the e-mail envelope below or called 828-738-3533 or 828-738-4724.